PLEASE NOTE: Your time at New Staff Orientation will be challenging because you will be juggling the responsibilities of a family along with your NSO commitments. The daily schedule is long and involves assignments outside of the general sessions and when childcare is provided. Please visit the KIDS section of the Cru19 website for all the information regarding childcare and registering your children. You are welcome to bring a friend or family member with you to Fort Collins to stay with your children while you attend classes and meetings. Offered beginning June 18, M-F, from 8:00am to 3pm. Special arrangements will be made for New Staff families to drop off their kids before 8am during the two weeks you will be taking classes. We will email you later with those details. Will be held at a Fort Collins public school building near campus, but not within walking distance. You will need a car or access to a car to utilize childcare. Offers age-appropriate programs to develop your children socially, mentally, emotionally, physically and spiritually. Is a licensed childcare program in the state of Colorado, staffed by fully-screened and trained Cru employees. You will need to purchase a lunch package (ages 3 & over), provide a lunch for your child, or pick your child up from the program during lunchtime. Medical forms must be filled out and signed by a physician before your child can enter childcare (grade 6 and under). Those forms can be found at https://www.cru.org/cru19/kids-forms/. During IBS classes, we encourage families to leave their children in childcare beyond the hours of their class (8:00am to 12:30pm) so you can have plenty of time to do homework and study for the class. Dads will probably need 3-5 hours of homework/study time per night for their two classes. During MPD week, the sessions are long. It is likely that your child will be in childcare from 8am to 5pm. We will be making additional arrangements to make sure that your childcare needs will be taken care of during the times that CKC is not offered. You will be contacted later about those arrangements. Kids in junior high or senior high (entering grade 7 thorough grade 12) will be in our junior/senior high program (CruStu). Information about these programs can be found at https://www.cru.org/cru19/crustu-getaway/. Childcare is not offered on July 4. For specific questions about childcare, please email our Childcare Team (cru19.childcare@cru.org). Will be taken out of your staff account sometime in August. $50 per child registration fee. June 18 – July 17: $160 per week for grades 6 and under; $180 per week for Jr/Sr High. US Staff Conference (July 20 – July 25): $260 for grades 6 and under; $320 for Jr/Sr High. Fees include the cost of field trips. Families will be assigned to a Suite Style Dorm Room, or you can secure local housing on your own. Before registering, please contact the Join Us Team (join.us@cru.org) regarding your housing options. Two extra-long twin beds and a sink in each room. Shared toilet and shower with adjoining room. Rooms are designed singles with a second bed added to allow for more people to be placed in AC dorms. 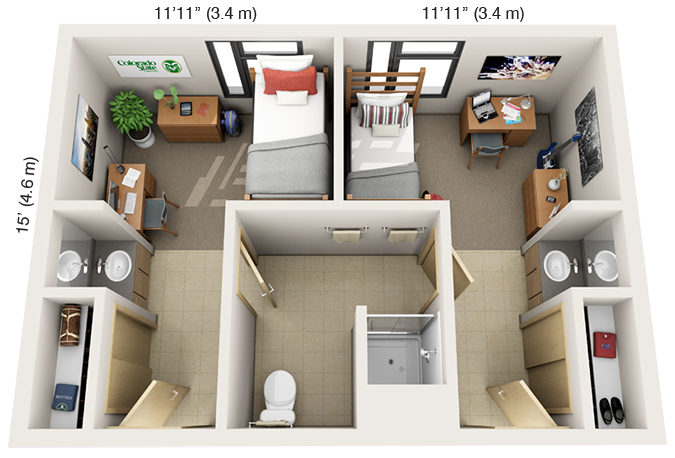 These rooms have only 1 dresser, 1 desk and fewer sq ft than other dorm rooms. Other major stores in Ft. Collins: Walmart Supercenter, Target and SuperTarget, Dollar Tree, Sears, Macy’s, Kohl’s, Bed Bath & Beyond, and many more. Thrift stores: Arc, Salvation Army, Goodwill, etc. Garage sales are plentiful in the summer in Fort Collins! Find listings on Craigslist, look in the local newspaper, or just drive around and look for signs. We value the contribution of our Moms and want to see them experience the same development all Cru missionaries receive. To help make this possible, we offer childcare each day during class. Of course, there is still substantial outside work to be completed. You’ll want to complete as much of the reading as you can before you arrive. We will work with you to help make it workable. It’s better to complete both classes now than to take ICT now and then have to come back to take BSM sometime before you report to your assignment. Please contact us (ibs.info@cru.org) so we can help you!